This Kalyana gosthu/ Veg gosthu - Kalyanam means Marriage. 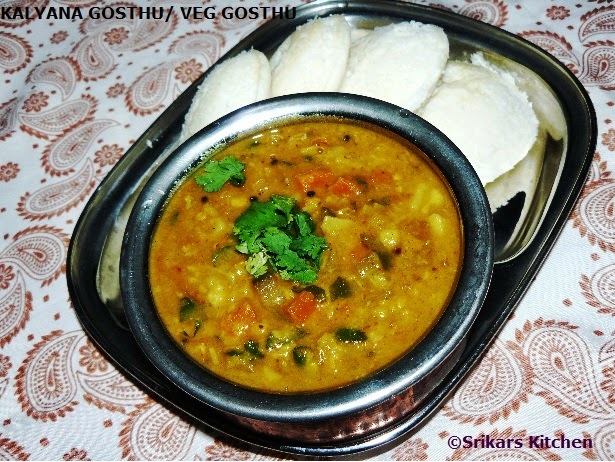 So This Gosthu is one of important side dish for every day breakfast during the Marriage. This is great combination for pongal and Idly. The Brinjal Gosthu is also called Chidambaram Gosthu which the best side dish of breakfast recipes. Tuvar Dal is also added instead of Moong dal.The specialist in this recipes is Gosthu Powder.It is one of the main masala in my kitchen, while making any sambar recipes, I add little powder & it adds a special aroma & flavour. Heat oil in a pan, add mustard seed, fenugreek seed,channa dal & allow to temper. Add curry leaves, G.chillies, onion & saut'e.Add chopped tomatoes & mix well. Add chopped potatoes, carrot, beans & cook 5- 6 mins,Add chopped brinjal & mix well. Soak the tamarind & squeeze the juice from it around 3 cups. Add the tamarind juice , sambar powder, salt & allow to boil. In the meanwhile , add oil in a pan, add all ingredients in the above list " Gosthu powder " & roast it and grind a coarse powder. Add the gosthu powder & cooked moong dal & allow to simmer. Finish with cilantro. This is best combination of Pongal, Idly , Dosa & Upma.